During my time in Washington D.C. I was lucky enough to witness a member of the Marine Corps promoted to captain. It was such an amazing ceremony, and I have gained so much more respect than I already had for the military. It was a truly amazing feeling to be a part of something so special. It was be a moment I will never forget. We woke up early Thursday morning. Got ready and prepared for a new day. We arrived at the Udvar-Hazy national Smithsonian museum in Fairfax, Virginia. The museum, from the outside, was noticeably immense, as it is composed of airplane hangars. We entered the Air and Space center and we were immersed into a new, amazing world aeronautical wonders. We watched a quick film about the deadly battle of D-Day in 3D at the IMax theatre. After the film, we were free to go, my friends and I took off into the hangars to get the full experience. We first visited the military and rescue helicopters, along with US military fighter jets. We then visited the space shuttles and other pieces of equipment, the Apollo spacecraft and satellites. Wrapping up our visit with the one and only “Enola Gay”, we were satisfied with our trip. It was truly amazing, the entire museum. I could easily stay there for 48 hours straight just looking at everything. I hope someday, I will be able to visit the Udvar-Hazy Museum again. George “Theo” Masterson is an eighth grade student, who currently plays D in lacrosse, he also likes to spend time scuba diving, fishing, and listening to jazz. 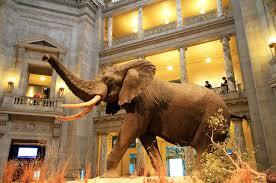 One of my favorite parts of the D.C. trip was when we visited the Museum of Natural History. My favorite exhibit was definitely the exhibit on human evolution because we have studied it in science throughout the year. I also found the exhibit on mummies really exciting. This museum was huge and there was a lot of really unique and interesting items like dinosaur bones, whalemodels, and a bug zoo. ​Amelia Whitcomb is a member of Student Council and winner of the 2016 Patriot’s Pen Essay competition. She plans to continue playing basketball and the tuba at Berwick Academy next fall. The Pentagon Memorial is one of the most bittersweet memorials I had seen on our Washington D.C. trip. 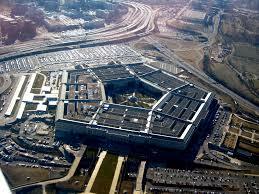 The Pentagon was one of the sites of the 9/11 attack in 2001. Today, people go there to honor and pay their respects to those who died. The memorial has a bench dedicated to each person who died during the attack. Each bench is faced a certain way whether or not the person was on the plane during the attack, or was inside the building when the plane flew in. All of the benches are lined in a diagonal row based on what year the victim was born. They have a reflective pool underneath that lights up at night. People throw coins in the water to show that they have been there. It is very beautiful anytime of the day and a very interesting memorial to visit. ​Sarah Pente once lived in Virginia and was visited at the monument by her aunt, an administrative civilian employee who was onsite at the Pentagon the day of the attack.